She has been called a "Renaissance woman, "a film pioneer" and a "leading figure in postwar Central European culture." The list of Elfi von Dassanowsky's talents and achievements support such superlatives as few biographies rarely do: opera singer, pianist, actress, film studio founder, producer, musical theater creator, teacher, cultural diplomat, humanitarian. Born in Vienna, Austria, Elfi (Elfriede) von Dassanowsky was at age 15, the youngest woman admitted to Vienna's famed Academy of Music and Performing Arts as the protégé of famous German/French concert pianist, Emil von Sauer. While still a student, she was chosen by film director Karl Hartl to instruct his rising new star, Curd Jürgens in piano, so that he could play the instrument on screen. Her studies and her budding operatic career were abruptly halted for extended labor service when she openly rejected membership in Nazi organizations. But her talent and beauty allowed her a second chance, and UFA Studios in Berlin offered her a star film contract in 1944, which she also declined. In 1946, Elfi made her opera debut in Mozart's Marriage of Figaro and her wide soprano to mezzo range gained her rapid fame in leading roles in such operas as Carmen, La Bohème, Cavalleria Rusticana, Die Fledermaus, and Der Freischutz. That year Elfi also initiated and performed in concerts for the Allied High Command at the behest of General Emil Béthouart of France and the American Lt. General Geoffrey Keyes. Her greatest achievement, however, is to be found in the realm of cinema. She remains one of the few women in history, and at age 23, one of the youngest to co-found a major film studio ---Belvedere Film Vienna. As film producer she helped revitalize Austrian cinema and discover such major European film talent as Nadja Tiller and Gunther Philipp. Additionally, Elfi starred in theatrical dramas, comedies, and on the concert stage. She initiated several musical theater groups, was announcer for Allied Forces Broadcasting and the BBC, toured Central Europe in a one-woman-show and gave master classes in voice and piano, often to refugees who could not gain entry into music academies. An expert in the Paderewski piano technique, her musical pedagogy continued in the U.S., where she married and raised a son and daughter. In Hollywood in the 1960s, she resisted becoming a starlet and preferred to remain behind the camera in an industry that did not yet accept women in the leading production role she had in Europe. Elfi subsequently achieved recognition as vocal coach for director/producer Otto Preminger and later became a successful Los Angeles businesswoman. 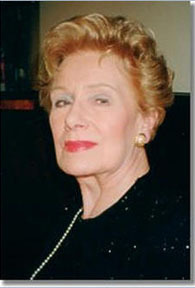 In addition to promoting Austrian arts and culture internationally, Elfi von Dassanowsky re-established Belvedere Film with her son Robert in 1999 as a Los Angeles-based production company, She has since served as Executive Producer of the award-winning dramatic short film, Semmelweis (2001), the independent spy comedy, Wilson Chance (2005), and is Associate Producer of the documentary The Archduke and Herbert Hinkel (2008). Elfi von Dassanowsky has been honored by the government of Austria, the cities of Los Angeles and Vienna, as well as by the State of California which declared February 2, 1996, "Elfi von Dassanowsky Day." She is the recipient of the Austrian Film Archive's Lifetime Achievement Medal, the honorary title of Professor granted by the President of Austria, the UNESCO Mozart Medal for her promotion of world peace through art, and the French Ordre des Arts et des Lettres. Her influential work has been hailed by such world figures as President Bill Clinton, Elizabeth Taylor, Sir Georg Solti and Princess Diana. As the press has noted, Elfi von Dassanowsky has been an international role model to women in the arts and society. Elfi von Dassanowsky passed away October 2, 2007.